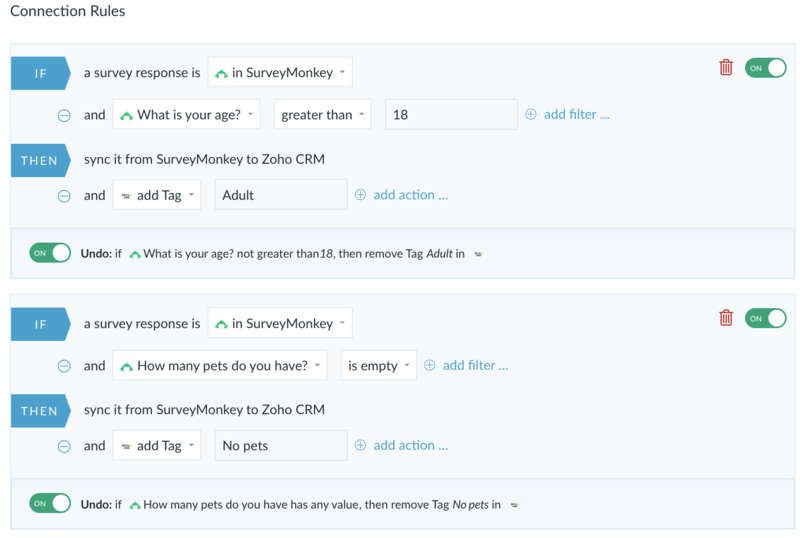 How to send across SurveyMonkey responses to a CRM? With SurveyMonkey you can quickly design and publish online surveys, and monitor the results in real time. The tool lets you compare your data to other businesses, putting your results in context and allowing your enterprise to grow with your target market's needs. When you click 'Authorize', a pop-up window appears asking you to log in and allow access. Note that Piesync can only connect to an Advantage or Premier SurveyMonkey account and as such, excludes the Basic and Standard Plan. 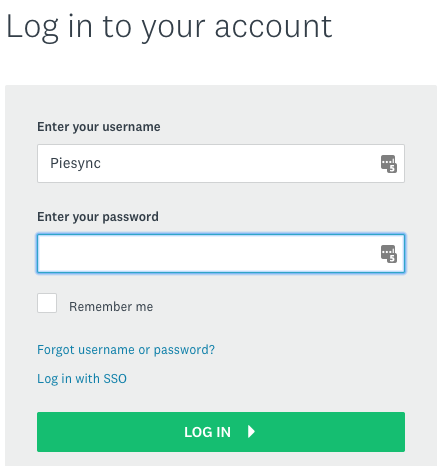 If you already authorized SurveyMonkey account(s) in the past or in any other PieSync integration, you'll be able to skip the first part of the authorization and choose from your CONNECTED ACCOUNTS. When setting up a connection with SurveyMonkey, the direction of the sync is set to one way. Therefore, we only have IF conditions. This integration works best if you are using an Email Collector in SurveyMonkey. If not, we won't be able to map the contacts' email addresses by default. This can be surpassed by turning off 'Avoid Duplicates', but beware of its consequences. You can custom map your SurveyMonkey Custom Fields. Bear in mind a mapping between two fields can only exist if the types of fields are compatible, and the particular compatibility will determine the direction of the mapping as well. More information on Customizable Field Mapping here. There are 2 strategies: rules or mappings. You can list several sync rules to have a certain responses translate to CRM attributes. For the full story, consider setting up direct mappings. Consider the following 2 examples (click to zoom). Rules are a great means to quickly trigger off tags in your CRM based on how responses are being filled out.This is the fastest & easiest way of quickly registering responses in your CRM. 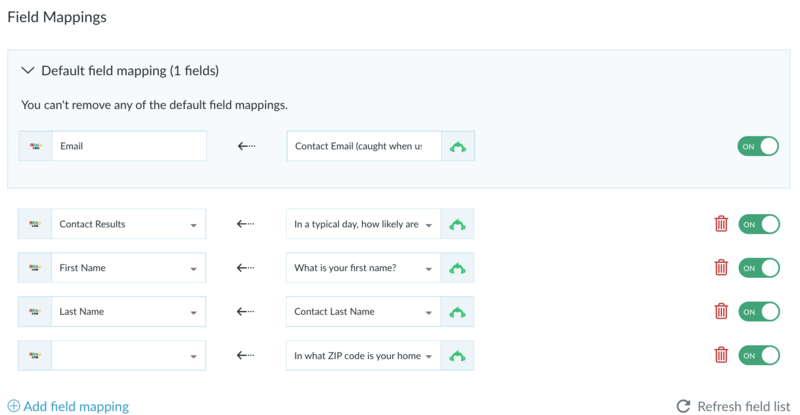 Alternatively, set up a direct field mapping at the bottom of PieSync's connection settings to transport the full contents of survey replies into your CRM. First you'll need to create dedicated fields in your CRM to store responses. Then you can rely on your CRM's built-in mechanisms to segment your audience based on the survey's answers. Currently, there are no SurveyMonkey integrations on the PieSync platform that support our deletions sync. 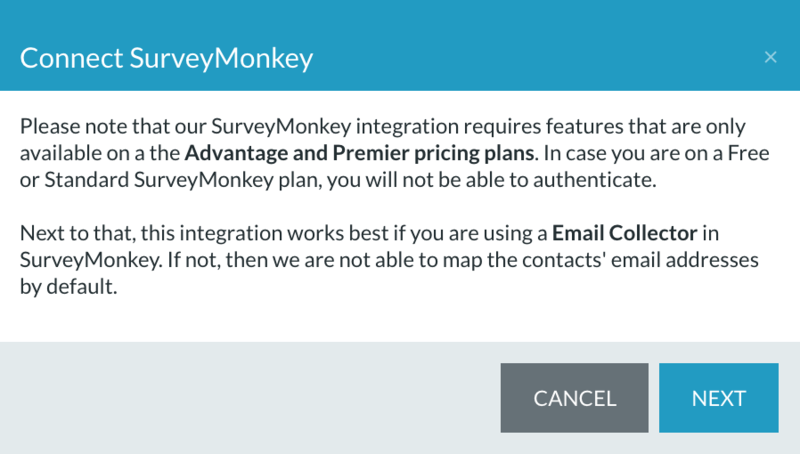 Currently, there are no SurveyMonkey integrations on the PieSync platform that support our unsubscribes sync.